This was certainly my view of a long distance runner when I got into the sport in the eighties. There were very few runners and most ran alone. Running was my escape and running alone was meditative. I would go on my runs and imagine running alone and enduring the pain and finally entering the stadium to the cheers of the crowd. 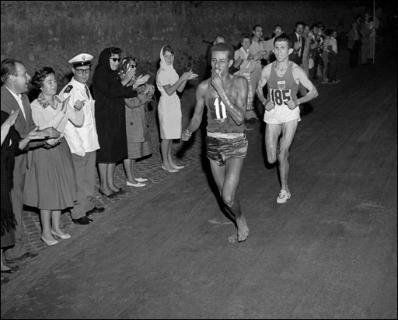 My running dreams were insired by the Olympic running clips on Abebe Bikila and Frank Shorter. Those were the days where I would be running in our neighborhood. It would be dark and the security guards would be counting each round of my 3K loop. Some people would shout and offer me money since they thought I could not afford to pay for my jeepney fare. I ran in the rain, in the heat and even late into the night. I ran when i could and it was mostly by myself. Today running is a social sport. There are runners everywhere and it is great. Everyone seems to be setting up group runs and they also have their running partners. I still run alone half the time when I don’t accompany my wife in her runs. My wife knows that I sometimes like to run alone. I guess old habits are hard to break and the loneliness of the of long distance runner is something I long for every now and then. I run at my own pace, at my own route with my own expectations, my own prayers, my own dreams, suddenly I am Abebe Bikila again. I guess being along is not so lonely. See you all the starting line and keep on running for fun.